Give the survey a name. 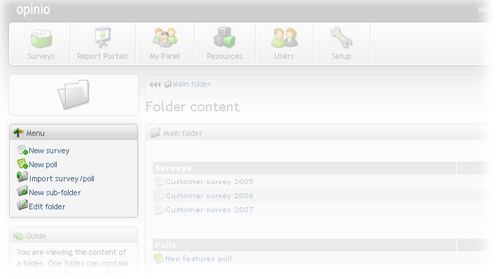 The name is not visible to respondents, but is used to identify the survey in Opinio. When the number of surveys in the system becomes large, it is useful with names that are descriptive and unique. Click on "Create" button. The survey is now created. You will see it in the list of surveys in the folder you are currently located. Click on this survey in the list to go to the survey main page.